The Windsor Tasting Lounge was started by four wine lovers who saw a need in the town of Windsor for Wine Tasting, a Wine Lounge, and a Wine Shop so they figured, why not combine the three? At the Windsor Tasting Lounge you get it all. A tasting room, a wine lounge, and a retail wine shop. 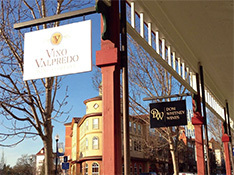 Featuring Dom Whitney Wines (a collaboration of Dominic Foppoli and Whitney Opperman) and Vino Valpredo Wine (created by husband and wife Natalia Valpredo Fritz and Clay Fritz), drop in tastings are available Wednesday through Sunday and larger groups are available by appointment. More than a tasting room, this is a Wine Lounge, where you can relax on the patio and listen to live music Thursdays and Fridays.